Just five minutes walk from the inevitable queues of art enthusiasts and the curious outside the Prado and across the road from the Museo Thyssen-Bornemisza which is chock full of classic and contemporary art is another, quite remarkable but less known Spanish museum. It contains among other treasures the oldest existing map, drawn around 1500, which shows the Americas, North and South. Yet this museum is far less frequented than many in Madrid, which is surprising when you put two words together and the light goes off in your head. The words are “Spain” and “exploration”. Spain was a powerful maritime nation and Spanish sailors like Álvaro de Mendaña de Neira in the 16th century explored large areas of the Pacific, and others went – quite literally in the case of Portuguese-born Ferdinand Magellan who did it first -- right around the world. On a massive map of the world painted along one wall of the museum the routes of exploration are illustrated and there, in 1574, we can see the voyage taken by Juan Fernandez who skirted the North Island's East Coast and the Coromandel. 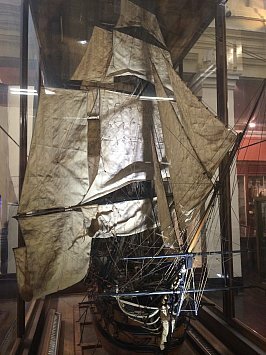 And that kind of remarkable maritime history makes the Naval Museum – which was established half a century before the signing of the Treaty of Waitangi – a fascinating place. History here is long, the stories full of hardship and the vessels which carried these intrepid and often heroic sailors and adventurers into the unknown were mostly ridiculously small. 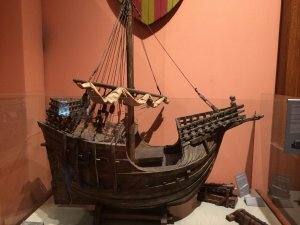 The rooms are filled with beautiful replicas of ancient caravels, period costumes, paintings of famous if long-forgotten battles at sea, collections of cannons, cutlasses and old guns . . . The paintings and flags are vividly colourful (they knew how to do a flag back then), the models – some very large – are breathtaking in their detail and the maps are works of art in themselves. That most famous and large map which has Europe and Africa in detail, and the Americas as a loose outline above and below what we now know as the islands of the Caribbean, is something to pour over. Some of the place names written in tiny script around the edge of Africa are much what they are today, although it seems the cartographer lumped all Africans together under one name: “Ethiopian”. With gold inlay and beautiful lettering it is like a holy relic and work of art combined. Very few of the explanatory cards in the museum are in English, but that hardly matters as most are easily decipherable and the collection itself so rewarding. 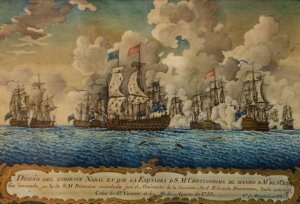 Spain brought back loot from all around the globe – the Chinese plates and pottery collection is extremely large – so if the Spanish Armada gets rather short shrift and the story of Spanish maritime prowess peters out towards the end you're not short of things to look at. The Naval Museum is well worth a few hours and if you have kids with you get them to find the painting entitled Vista Panorama de la Entrada del Puerto de Mahon. Whoever painted it around 1775 had a sense of humour. The kids will delight in pointing out to you what that cow is doing on the hillside in the foreground. I wish we had known about this, after over-dosing on art museums in Madrid in January. However, your recommendation regarding the Madrid food walking tour was very timely. A very tasty experience. In turn, if you visit Barcelona, I would recommend the bike tour--three hours of leisurely pedalling around the city, with snacks at the beach. GRAHAM REPLIES: I feel your OD on Goya etc. That Madrid tour is excellent (readers, just search for "Madrid" and go to Our Man in Madrid) and I do hope to get back to Barcelona. But me on a bike? Won't ever happen! [editor:html] I wish we had known about this, after over-dosing on art museums in Madrid in January. However, your recommendation regarding the Madrid food walking tour was very timely. A very tasty experience. In turn, if you visit Barcelona, I would recommend the bike tour--three hours of leisurely pedalling around the city, with snacks at the beach. GRAHAM REPLIES: I feel your OD on Goya etc. That Madrid tour is excellent (readers, just search for "Madrid" and go to Our Man in Madrid) and I do hope to get back to Barcelona. But me on a bike? Won't ever happen! Morocco: You want nuts with that?